The year 1984 is a very important special year for me, because I was born that year. Well, on the serious front, being a Delhiite I have heard many first person accounts of the 1984 riots. When merely listening to those accounts shook me, imagine what those people would have gone through. 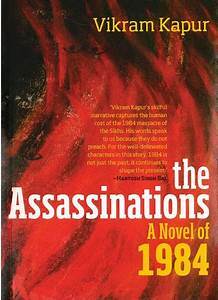 I hardly get to read anything about 1984 these days, so I was quite intrigued when i came to know about this book. The cover bore a fiery read look, symbolising the flames that had engulfed the once peaceful city and burnt many lives, hopes, desires and friendships. All that they left behind were burnt houses, burnt lives and ugly scars that refuse to leave the hearts of those affected. If you have lived in Delhi during the 1980s, you would have your own set of memories related to the 1984 riots, irrespective of your religion. Having been born and brought up in Delhi, I have heard several accounts of the riots from my parents and in-laws. Those few hours of lawlessness left scars of a lifetime to many lives. I recall having once met a Sikh uncle at a social gathering whose one arm was amputated. When I asked my mom how he lost his arm, she made a grim face and told me in a hush tone, "He lost his arm in the 1984 riots". While uncle was happily enjoying his Patiala peg, I am sure the drink would do nothing to remove the ugly memories from his mind. When my mom in law came to know about the plot of the book, she went in past and recalled how houses were burnt in the nearby colonies. In my previous organisation, a Sikh woman told me how she and her family had to hide in the Gurudwara for days before they felt safe to venture outside. To feel unsafe in one's own home is the worst fear come true and sadly, this happened in the city I call my home. For those who unlike me, haven't had the chance to hear the stories of survivors, The Assassinations beautifully narrates how one incident can affect the destinies of multiple generations. The book portrays through Prem, Deepa and their families the physical, social and emotional trauma people went through in the times that followed the assassination of Mrs. Indira Gandhi. Prem, the son of a migrant Punjabi family and Deepa, the daughter of a an affluent Delhi Hindu family are head over heels in love. Even as Deepa's father, a beaurocrat has his hunch on the upcoming situation becoming tense due to Operation Bluestar, the father in him is unable to say no. While Prem and Deepa are engaged and weaving dreams of a rosy life ahead, the flames of Operation Bluestar and its aftermath reach Delhi. In the lawlessness and riots that followed, Prem was transformed overnight from a guy next door to a youth with endless turmoil going in his mind. The effect is seen on their relationship as well, however keeping the focus on the aftermath, the book does not unnecessarily drags on their relationship. While reading a book like this, one often anticipates the next, so while I had anticipated Prem and Deepa to be the focus till the end, I was shocked when they both die in a militant attack. I think it was the powerful narrative after their untimely death which brings brownie points to the story. The story suddenly shifts focus to the lives that remain, how they try to pick up the remains and move on. While Deepa's parents live a life of endless guilt having agreed for the match, Prem's family tries best to escape the tag of a militant's family. The story fast forwards two decades later, where both families are seen struggling with the after affects of the incident. They do move on physically, however the scars on their hearts refused to fade. One has to be very careful when touching upon such a sensitive topic as Operation Bluestar and the 1984 riots. I am impressed how the author beautifully captured the pulse of those times without any exaggeration or digression. The chapters are divided aptly before and after 31st October 1984, which makes it easy to understand the sequence of events. Each character is penned thoughtfully and has an important role to play in depicting the mindset of each generation. The consistent pace of the book is its biggest plus point. Without any exaggeration, the book is able to keep the reader glued and one literally feels transported to 1984. Unlike a lot of books that use such incidents to grab eyeballs without focusing much on the storyline, The Assassinations is a book that delivers what it promises. The powerful story not even once loses focus from the core issue and even as you flip the last page, your heart might say a silent prayer for those who suffered in those horrible times. For a moment, I felt as pained for the characters as I had felt while watching the 90s movie Maachis. A must read, for its powerful narrative. I received the book from WritersMelon for an honest review.